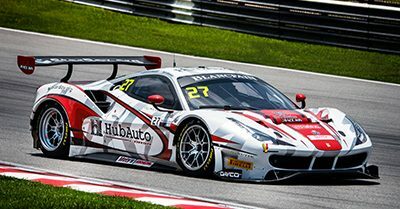 April 7, 2019 – Highly experienced Australian and international GT racer David Russell achieved a podium finish in his debut Blancpain GT World Challenge Asia Series race held at the Sepang International Circuit in Malaysia on April 6 and 7. The talented Dayco Ambassador teamed with Japan’s Yuya Sakamoto for the first time with the HubAuto Corsa Ferrari Team to finish 3rd overall in Saturday’s opening race and first round of the championship after having qualifying 6th. The Ferrari duo followed that up with a 6th place overall finish in Sunday’s highly competitive second round. These strong overall results were achieved despite the HubAuto Corsa drivers having missed out on a pre-race test day due to the team being delayed on their return from the USA, where they took top honours at the California 8 Hour IGTC race. These results complement Russell’s prior GT podiums and victories gained in Indonesia, the Middle East and Europe during his international GT racing career. “It is so great to be back racing on the international GT stage as I have really missed this type of intense competition,” Russell said. “The Ferrari is a great car to drive, it is very different to all of the other GT cars I’ve driven and I feel I haven’t quite got it 100% yet after the limited running over the race weekend. “It is fantastic to have a podium in my first ever round with the team especially as the Blancpain GT World Challenge Asia level of competition this year has definitely stepped up. Russell and Sakamoto return to Asia’s most competitive GT series for the third and fourth Blancpain World Challenge GT Asia rounds to be held at Chang International Raceway in Thailand on May 11 and 12.